No offense to the lead creator of Mega Man, but the words “From Keiji Inafune” in the debut trailer for a new Xbox One game called ReCore weren’t what excited me most. It was what came next: “and the makers of Metroid Prime.” And that was before I even found out what the game actually is. On the final day of E3 last week, in a conference room at the Xbox booth, I discussed ReCore with Inafune and Mark Pacini—the latter the former game director of Nintendo-owned Retro Studios’ three acclaimed Metroid Prime games and now head designer at indie studio Armature. Inafune would arrive a few minutes late and then rapidly change his outfit, shedding a t-shirt for his other upcoming project, the Mega Man spiritual successor Mighty No. 9, and pulling on some ReCore duds. I started my chat just with Pacini, a guy I’ve been eager to play a new game from for years. I really liked the Prime games and have been following Armature’s winding, frustrating path since the studio was formed in 2008 by Pacini and fellow Retro veterans art director Todd Keller and technical engineer Jack Matthews. For all their talent, they’ve not had many new games to show for their labor, just a 2013 Batman Arkham spin-off designed in the style of 2D Metroid games. Planned work for EA never came to pass, and a collaboration with Inafune a half decade ago was cancelled about nine months into development. Finally, here we are. Finally, here I was, really, speaking to Pacini (and eventually Inafune) about an actual new game from these guys that we are very likely going to play. ReCore, Pacini clarified to me, is a third-person game. 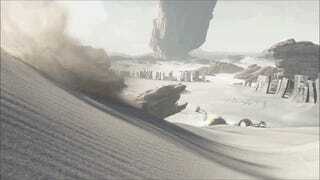 It’s non-linear, putting players in an open landscape that is affected by shifting sands. Players control a female protagonist named Jewel Joule who befriends several energy cores—spheres of light that have personality and that can be placed in “frames” shaped like a dog, a gorilla and who knows what else. The blue core in the trailer is named Mack. “He prefers to be in frames like the dog frame because he is a more gentle,” Pacini said. “But you can put him in all kinds of machinery.” Based on the game’s debut trailer, it looks like Joule will befriend a whole crew of cores. They’ll help Joule fight and help her explore. Once Inafune arrived, I wanted to know more about his cross-Pacific collaboration. This is, after all, the second time Inafune has tried to work with Armature. Their first project, back when Inafune was top game designer at Capcom, was a first-person Mega Man game, according to leaked footage and details published by the website Polygon in 2013. Inafune and Pacini didn’t take the bait to talk specifically about that project, but they talked around it and shared their desire to collaborate again. About a year and a half ago, Inafune, now an indie developer himself running a studio called Comcept, was back in touch. Pacini said this new collaboration has worked similarly to how he and his Armature colleagues worked with Nintendo’s Japan headquarters when they were making Metroid Prime games. Armature, like Retro, is in Austin Texas. Nintendo is in Kyoto; Inafune’s team in nearby Osaka. Inafune’s team hatched the main concept and approached Armature to build it into a game. “We have a good rapport and mutual respect,” Pacini said. “They’re more for character world-building, major themes of the game. Armature is spearheading more of the moment-to-moment mechanics, how the world is laid out, the systems, the engineering of the game.” He acknowledged that there is “tons and tons of overlap” among those duties and that Microsoft is also collaborating, mainly helping refine the game’s story. The Comcept and Armature teams used to meet frequently face-to-face, now they’re talking on Skype about once every week or two. For a game that’s been in development over a year and is set for release in the spring, details about ReCore are scant. We haven’t even seen any actual gameplay footage. But the people involved in this game on both sides of the Pacific have absurdly good track records that earn them some benefit of the doubt. Their game sounds good, their collaboration intriguing. With any luck, this second try for both of them will be the charm.